It's the middle of summer, and I can't stop daydreaming of my fall wardrobe. 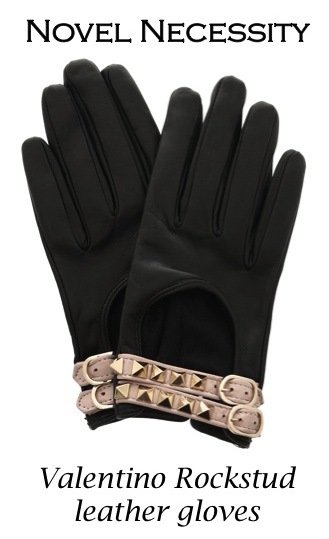 When I saw these studded leather gloves appear on Net-a-Porter I instantly added them to my lust list. At $445 Valentino's Rockstud leather gloves will set you back a pretty penny, but that's a small price to pay for something fashionable and functional, right? Supple black leather, strategically placed cut outs and blush pink straps adorned with pale gold pyramid studs allow them to take your cold weather wear from lady to lover in a heartbeat. SUCH A GREAT GLOVES!!!! I WANT THEM!! i'm your follower n.540 follow my blog? :) lovely photos!!! oh my gosh, I need them! Wow! These are hot, really hot! Love them! Want them badly! Hi thank you for your comment on my blog ..
Those gloves are amazing. And I'm with you- I'm totally dreaming of my fall wardrobe too! The same here! Nice blog! if only i were so cool as to be able to rock these gloves with real confidence. soon soon. I love anything with studs so of course I love these. Possible DIY, maybe? Amazing gloves! I'm a totally lover of Valentino studds! the Valentino's are gorgeous !! OMG they are soo cool! These gloves are absolutely stunning! I absolutely love those gold accents! it´s great to see your nices ideas!